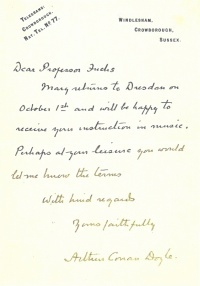 This letter was written by Arthur Conan Doyle circa september 1907 from Windlesham, Crowborough. Mary Louise Conan Doyle was the first daughter of Arthur Conan Doyle. She was in Dresden, Saxony (Germany) from 1907 to 1910 where she studied music. Mary returns to Dresden on October 1st and will be happy to receive your instruction in music. Perhaps at your leisure you would let me know the terms. Photo courtesy © Brian W. Pugh Collection. This page was last edited on 27 May 2018, at 00:07.